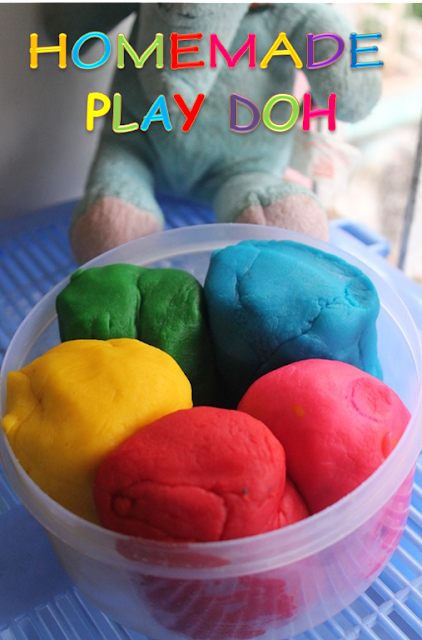 My little one loves play doh. I used to buy it at stores very often, since my little one throw it at random places and when i find those, it is hard and unusable. So i have to keep buying it often, which i found a waste of money. So i decided to make it at home. When i searched online for recipes, most of the recipes has cream of tartar in them. I couldn't get it in my place. So i looked for recipe which dont used them. I came across no cook play doh recipe. 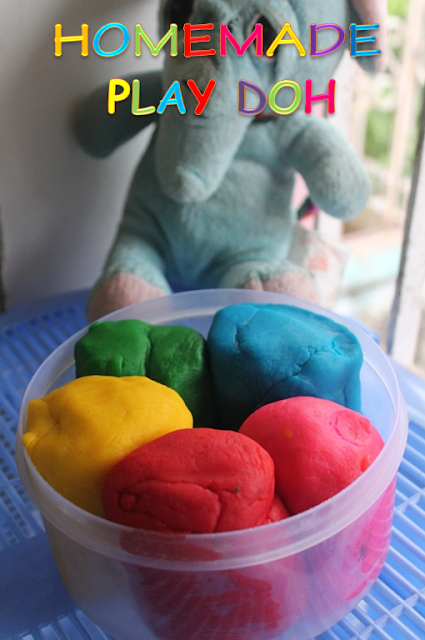 which i was not confident enough to try, because i thought it will turn like a chapati dough and would dry up soon. After many research and googling, i finally stopped with this recipe. I would say this is a fool proof recipe and it is just amazing. Plus you have the satisfication that it is kids friendly. 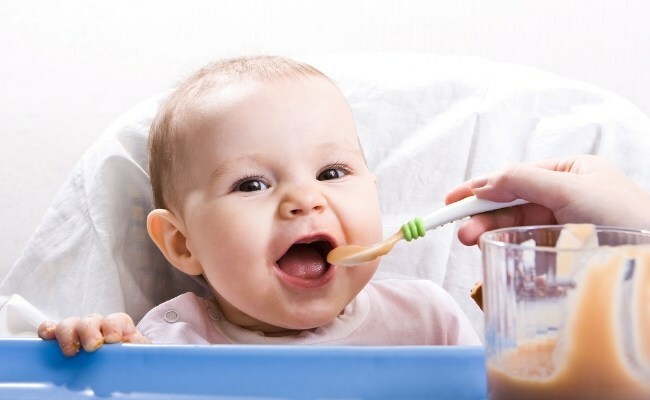 Even if you have the toddler who puts everything in mouth, this is completely safe. 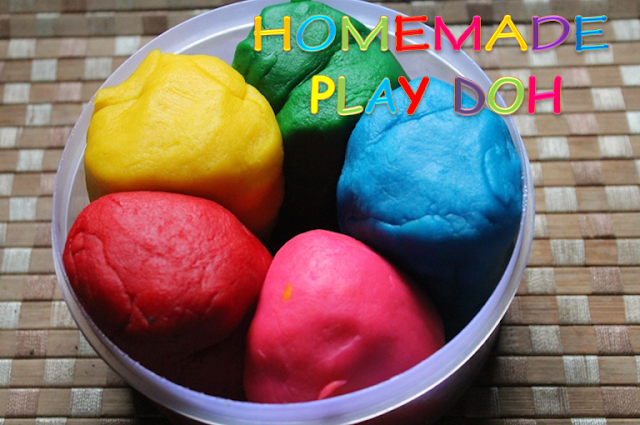 This play doh is so soft, easy to work with, long lasting and kids friendly. You could just put this in a air tight container and store it away for many months. This doesn't get dried up easily as well. So it is easy to work with. Hope you will give this a try and let me know how it turns out for you. Take all the ingredients in a sauce pan, mix well. Cook on a low heat till it thickens and leaves the sides of the pan and comes as a nonsticky mass. Remove it to counter top and cool it down. 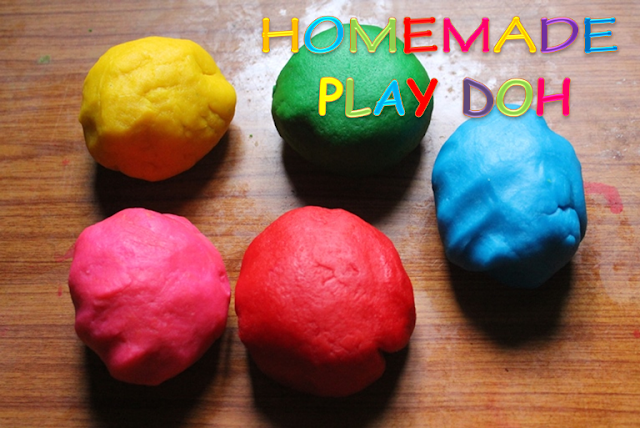 Now knead it to form a smooth ball. Once it is cooled, store in a air tight container. Wash the pan and repeat the process with different colour. take it in counter top and cool it down. Hi aarthi, can I use sesame oil or coconut oil instead of veg oil? Would the smell be a problem? Thanks for sharing.came out really well. 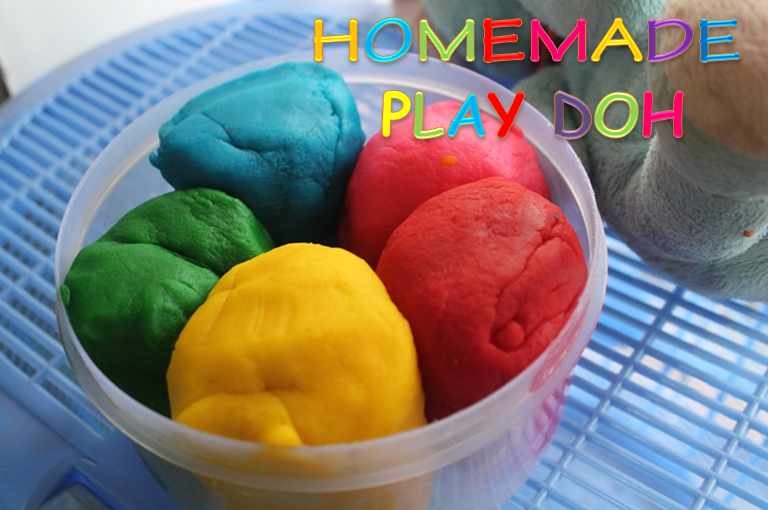 Thanks soo much for this...it's an awesome method to make play dough...no mess and easily available ingredients :) I am one super happy mom! !